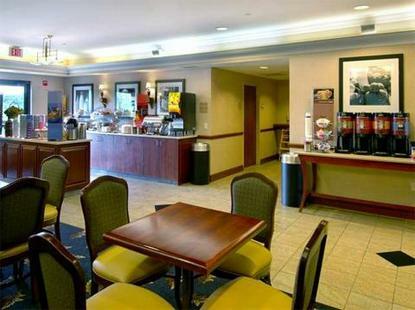 Hampton Inn Potomac Mills/Woodbridge is located .5 mile off of I-95 in Woodbridge, VA, 17 miles south of Reagan Washington-National Airport and 40 miles south of Dulles International Airport. Area attractions include historic Occoquan with waterfront shops and restaurants, shopping malls, Leesylvania State Park, minor league baseball, and the sites of Washington, DC, 19 miles north. Within 2 miles you can dine at Caf? Rochambeau, Occaquan Inn Restaurant, Sea Seas Restaurant, or Hunan Imperial.We feature 87 rooms, including deluxe rooms equipped with micro/fridge units, indoor Jacuzzi, exercise room, indoor pool, spa and sun deck, and hospitality suites/meeting suites. Amenities include complimentary breakfast bar, local phone calls, USA Today, in-room coffee maker, iron/board, two-line phones, dataport and voice mail, and color TV with remote, cable and complimentary movie channel (HBO). We also offer connecting rooms, cribs, express checkout, hair dryers, microwave/refrigerator, fax & copy service, vending machines on every floor, work desks and office style chairs, and safe deposit box. Laundry/valet services, guest laundromat, meeting/banquet facilities, audio visual equipment, golf, and secretarial services are available for a nominal fee.